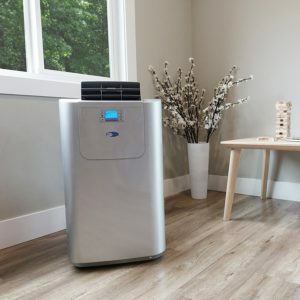 Whynter - Elite ARC-122DS: Portable Air Conditioner Review • The Air Geeks, reviews of air conditioners, dehumidifiers and air purifiers. Whynter Elite ARC-122 DS is a dual-hose portable air conditioner that offers a cooling capacity of 12,000 BTU. This air conditioner has incredible features such as a dehumidifier, an adjustable digital thermostat, a remote control, and a 24-hour programmable timer. This unit can be used to cool, dehumidify, and circulate air in your room. It is suitable for use in offices, server rooms, classrooms, garages, workshops, bedrooms, living rooms and other spaces. Its compact size and dual-hose system allow for better utilization of space and efficient cooling. If you have identified the Elite ARC-122 DS dual-hose portable air conditioner as a suitable solution for your air conditioning needs, you are most likely looking for more information about it, especially its features, performance, strengths and weaknesses. The information we have compiled will certainly help you to make a well informed decision. Without much ado, let us begin with its features. The Whynter Elite ARC-122 DS is an impressive air conditioner with a cooling capacity of 12,000 BTU. The manufacturer recommends it for rooms that are as large as 400 square feet. However, we have observed that it can be used for spaces that are as big as 450 square feet. Unlike most portable air conditioners, this air conditioner has a dual hose design. This is a special feature that eliminates the problem of negative air pressure that is common with single hose appliances. This unit does not allow entry of warm air from outside or other rooms into the room where the unit is installed. Apart from cooling the air, the unit has a dehumidifier that allows you to control the moisture in your room. 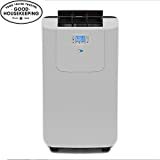 This dehumidifier extracts excess moisture that can cause mold to grow in your house posing health risks as well as damaging your valuables. This portable unit can extract up to 76 pints daily. The noise level of this unit is also relatively low. It has an extremely quiet compressor and the fans produce a nice white noise that makes it hard to tell whether it is running or not. This means that it is unlikely to disturb you when working in your office or when relaxing in your living room. This unit is also equipped with a carbon filter that helps in removing bad odors from the air. The Whynter Elite ARC-122 DS comes with a digital remote control that allows easy control of speed, temperature and dehumidifier settings. However, we have noted that the fans do not stop once the desired temperature is attained. In addition, we have observed that this unit does not show the current temperature. Instead, it is designed to show the set temperature only. This air conditioner is heavy, and it is difficult for one person to move it when it is wrapped. However, when unwrapped, this portable unit has castor wheels that allow you to move it from one part of your house to another with ease. Moreover, this unit has a 24-hour programmable timer. By using this timer, you can set your air conditioner to cool your room even before you get there. Relatively quiet. This unit has an extremely quiet compressor, and it is hard to hear any noise when the fans are running. This means that you can work or sleep without disturbance. Efficient cooling. Our study has revealed that this unit is one of the best air conditioner for medium rooms of up to 400 square feet. The dual-hose system makes cooling more efficient. Strong dehumidifier. This machine can extract up to 76 pints of excess moisture per day. Difficulty in installation. The dual hose design makes it difficult to install the unit in a short time. If you are not well equipped with installation skills, it can take you up to two hours. Small internal container. Although the unit can remove up to 98% of moisture through the exhaust vent, its water container is small considering its high capacity of pulling moisture. Temperature display: the unit shows the set temperature but does not show the current temperature. The main reasons why I bought this unit were its efficiency (EER=12) and the noise level. I am very pleased with the performance and also the quietness. All you hear is the fans which produce a nice white noise. The compressor is extremely quiet and it's even difficult to tell if it's running or not. The unit is well design and its looks didn't compromise my conference room's appearance. I have a window behind my projector screen so I was able to hide the hoses very well. I wish the fans would idle when the unit reaches the desired temperature but they keep going nonstop. The unit also doesn't have an option to show the room temperature. All you see is the set temperature. The dual hose system does make a huge difference by eliminating the negative air pressure caused by single hose systems which forces warm air from other rooms or outside to make its way to the room you're trying to cool. This is my fourth portable AC unit and by far the very best. I am well pleased with my purchase." Easy setup, pumps good amount of cold air. Only thing is with the drain - claims say it evaporates 98% of moisture thru exhaust vent. I call bs on that part. There is an option to move the unit to a drain or outside and pull the plug (which I did the first time) and about 12 oz came out. Realized the internal pan is quite small. I needed this to run 24/7 without shutting off due to full drip pan. I grabbed an old washer drain hose and cut it to about 18". Let it drip into the 4 gallon Home Depot bucket setting next to the unit. It will fill that bucket on Low setting in about 2-3 days, depending on how hot it is. Much easier to carry a bucket out every couple days than in hooking the unit from the window and wheeling it out every few hours." The Whynter Elite ARC-122 DS dual-hose portable air conditioner is undoubtedly an impressive unit that offers incredible air conditioning performance. Designed for spaces that are up to 400 square feet, it is suitable for cooling, dehumidifying, and circulating air in your room. Its low level of noise makes it a suitable choice for areas that demand quietness. However, we have observed that it is not easy to install this unit, especially for beginners. Moreover, this unit has a small container for storing captured moisture. There you have it! You can now make an informed decision.